dear mom. thank you for planning a birthday trip to chicago for lil OLD me ;-)!!! i love you so so much and had so much fun laughing and talking with you. dear amtrak. thank you for the smooth, yet very bumpy ride to chicago. any traffic avoided was well worth the bumps. horn at all the lowly pedestrians. dear cab driver. thanks for being a cute, non scary nice girl. dear bell boy. i am sorry my mom took the $12 tip away from you after you pulled the suitcase out of the trunk for her. you shouldnt have stuffed the money in your pocket so quickly. no, i am sorry...lifting ONE suitcase does NOT earn you $12. she does those kinda things...accidentally. dear forever 21. thank you for making several floors of cheap clothes. i get bored of clothing easily, so cheap is always the way to go. dear moms cell phone. i know you tried to pull a fast one on my mom by hopping out of her purse.thanks to you, she got a little extra exercise in having to walk all the way back to the hotel to find you. dear bussers, water givers, security greeter people, several hundred people rushing to open the door for us. do you all expect a tip? or is a thank you good enough? i am completely unsure what to make of so many people wanting to "help." dear mascara. sorry i almost put you on my lips. my bad. dear ruth chris. whoever you are, your steak melts in my mouth. for real. dear omni hotel. please update your website. when you say you have a hot tub, we most definitely expect to use it. when you are renovating, ya might wanna say so since we booked a hotel specifically with a "hot tub." dear delicious food. stop now being so delicious. i mean it. dear full nights sleep. thank you. that is all. thank you. dear toe. why must you let my toenail grow into you? who told you to do that? it makes walking nearly impossible. dear magnificent mile. you are indeed, mangificent. dear wesley. stop reading my blog post out loud as i write it. i feel like a 2nd grade teacher and you are my student. dear elevator. stop tricking me. i keep ditching you on the wrong floor and its usually in front of an elevator full of Swedish or Norwegian men and i look like an idiot when i walk out and walk back in. dear mom please let me see kids conversation in the darnest things that kids say. dear wesley. stop hijacking my blog. adorably cute. thanks for making me feel pretty. dear starbucks. i like alterra better. but your hot chocolate offered me some cozy warm goodness ON a brisk chicago morning. for a mom with 3 kids who needs one now and then. but they will be fine, and so will we... and we can always find excuses not to do the things we want to... (not that having 3 little kids isnt a good excuse-haha) but i just feel like its a good time and the opportunity presented itself. so i am excited.. =) sooo nice to meet you!! thanks for stopping by..
Haha awesome AND I LOOOOOOOOOOOOOVE me some chicago! 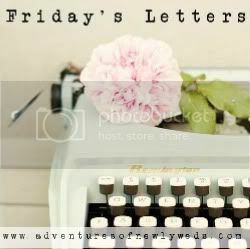 You should link-up with Adventures of Newlyweds for Fridays Letters! Haha this was hilarious :) And Chicago is one of my favorite cities! chicago IS a great city..and its so close to me.. i dont have to live there to enjoy it =) thanks for stopping by! Love your letters! I'm jealous you live so close to Chicago...what a nice getaway spot! definitely a plus living only an hour away...milwaukee is a decent sized city..but its always nice to get away =) thanks for stopping by! I think this is awesome that you dedicated a post to Chicago. I have never been and I really want to travel there. I love all of your letters. thank YOU! Yes chicago is so much fun! and a quick easy getaway for me =) woo hoo! !